Living rooms are in the running for the area in our homes that we spend the most time in. So it’s no wonder why it we often desire a change or an entirely new look for this space. Of course, remodeling your living room, even to a small extent, can get pricey. Living room furniture, specifically, can come with a high price tag when you purchase it from retail furniture stores. However, refreshing your living space does not have to be challenging, nor does it have to be budget-breaking. You can find everything you need to add some life and color to your living room at Consignment Furniture Showroom and Gallery. When looking for furniture to add to your living room, make sure to choose furniture that will fit your lifestyle along with your everyday activities that take place in your living room or area. 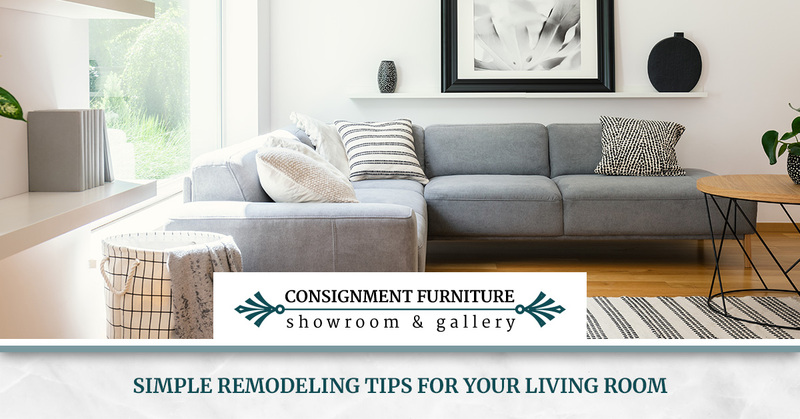 When looking for furniture for a living room remodel, make sure choose furniture to fit your lifestyle and the everyday activities that will take place in the room. For example, if you have pets, you may want to refrain from delicate furniture that will show signs of wear easily. If you host guests frequently, make sure to add enough seating to ensure that everyone is comfortable. Deciding on a color palette beforehand will make it easier to find the best living room furniture for your project. Think about what type of mood you want to create in the living area if you are unsure of what hues to highlight in the space. Keep in mind that you can always add additional color to furniture pieces by implementing accessories like pillows, area rugs, and lamps. It is easy for homeowners to get the temptation to splurge when remodeling their living area. If you want to create the maximum impact in your living space without breaking the bank, then do all of your shopping at Consignment Furniture Showroom and Gallery. You will get the best selection of new and gently used furniture at a fraction of the normal retail price. Once you are ready to shop for living room furniture, come visit Consignment Furniture Showroom and Gallery. We carry a variety of furniture styles and designs at both of our used furniture store locations, all at unbeatable prices. To find out how we can help you save without sacrificing on style, call us at 727-347-3982 (St. Petersburg) or 727 447-0926 (Clearwater).